Donnington Brewery house and when in the heart of the Cotswolds it would be rude to not go LocALE. Carvernous lounge with multiple TVs, Decent looking food, one table free on a saturday lunch. Whats even more astounding is the £2.70 pint of Donnington BB. Another Tuesday visit to MinM using my Oxfordshire Day Ranger train ticket! First stop is always The Black Bear which was busy on market day and doing a brisk food trade. Donnington beer again - perfectly drinkable and still well priced. Even though it is busy I've never had to wait for a drink and always found a seat. Landlord is an ex.Scottish footballer! I always visit this pub when I am in Moreton and it forms part of a little pub crawl between trains! 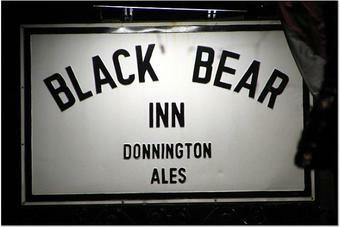 Yes,you can get better Donnington beers in other pubs but my pint was fine and at �2.50 I wasn't complaining. Many Donnington Brewery pubs are hard to get to by public transport so this one is useful as there is a reasonable train service from Oxford/Worcester and beyond. Very busy (Tuesday is market day and the main street is very lively with coach parties coming and going). The big right-hand bar does have 4 TVs but the sound was off. However,it is a bit excessive and can be distracting. The food looked substantial although I have still never eating here. Note the collection of football "rugs" on the way to the loos. Freindly and busy with the local populous. Having tried Donnington beers at a pub nearby (The Fox Inn), we we're disapointed to find the quailty was not as good (tired) - This could be a one off. Called in for a meal whilst camping in Moreton and we were really pleased that we did. Yes, it is a bit of a sports bar on the right hand side with 3 tv's, but the Landlord is an ex Southampton player who won the FA Cup with them. There were 14 of us eating a meal and we couldn't have been better looked after, the food was good and hearty and the Donnington BB pretty tasty too. A great evening for us and well worth a visit.